I would like to extend a warm welcome back to historical romance author, Elizabeth Meyette! Her new release, Love’s Spirit, releases on April 22nd, and is a follow-up to her first novel, Love’s Destiny (available for pre-order here). Betty, your fans have a lot to look forward to with your new release. Let’s get started! Tell us about Love’s Spirit. Hi, Amanda, thank you for inviting me to your blog today. Though Love’s Spirit is the sequel to Love’s Destiny, I’ve been told that it works as a stand-alone, too. Set in colonial Virginia as the American Revolution is beginning, it continues the story of Jonathon and Emily Brentwood. As the story opens, Jonathon, severely injured from wounds he received as a prisoner of the British, is in hiding. Emily, believing he had been killed, is thrilled to finally unite with him. But he is at risk at being recaptured by the British, so they are separated once again. Deidre Manning, Jonathon’s life-long friend and former lover, discovers Jonathon’s whereabouts and sets out to claim him at last with a plan that is the severest test of the love of Jonathon and Emily. Danger doesn’t lurk just for Jonathon; Emily’s life and the life of their unborn child hang in the balance, too. What do readers need to know about Love’s Destiny before reading the sequel? One of the main conflicts in Love’s Destiny is the fact that Jonathon is a patriot working with the Sons of Liberty and Emily is British. When Emily moves to Virginia, she is upset about the rebellion against the king and Parliament. Eventually, she demands to be taken back to England and it is during this trip that Jonathon is captured, and she thinks killed. Blaming herself for his “death” she returns to Brentwood Manor so their baby can be born in Jonathon’s home. Another obstacle to their happiness is Deidre Manning, who believes Emily stole Jonathon from her and is set on revenge. 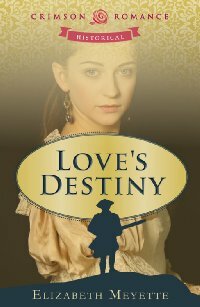 Did you always know there would be a sequel to Love’s Destiny? Not at all! I wrote it as a stand-alone, but my readers kept asking me when the sequel was coming out. Many people told me they couldn’t wait for what happened next. I was so surprised! Now I’m hearing from beta readers that they can’t wait for the next book in the series LOL! B oth Love’s Destiny and Love’s Spirit have beautiful covers. Do you buy a book by the cover? I love both covers, and before I saw them, I was really worried about how they would turn out because some romance novel covers were so cheesy back in the day. Crimson Romance cover art people are awesome! It’s like they read my mind and knew exactly what I wanted my cover to convey. I don’t judge a book by its cover. I think because I taught literature for so long, I know some excellent books may have very plain covers. But I hope readers will so love the covers of Love’s Destiny and Love’s Spirit that they can’t resist buying them! Yes, I am working on a mystery set in the Finger Lakes region of New York. While we were traveling back to my hometown of Rochester, NY last year, the first sentence of my book wormed its way into my head. The next sentence followed, then the next until I had the first paragraph. I knew that a house would play a major part in the book—almost like another character. My husband suggested I set the mystery in the Finger Lakes area and while we were visiting that area I saw the exact house I had pictured. I am not making this up!!! I told him to stop the car and we got out and took all kinds of pictures of the house (it was abandoned, just as I pictured). I was so geeked! When I retired from teaching, I used the principles of Feng Shui to organize my office and that is where I work. The when is trickier. I tried to establish a schedule of writing days, but life happens and other commitments come up. I find myself still writing in my pajamas at 4 p.m. some days, and others I might not sit down until after lunch. I have a lot of freedom to decide for which I am very, very grateful. I would like to read some of my favorite mysteries again to get me in that mindset as I wrangle with writing my own mystery. I love Agatha Christie, so perhaps And Then There Were None or Murder on the Orient Express. Patricia Cornwell is great, too, so I will be pulling some of her books back off of my shelf. Thanks again for inviting me on your blog today, Amanda. I wish you continued success with Rhianna and Audra. Many thanks for coming by today, Betty! Nice interview, Elizabeth and Amanda. I enjoyed the first book, so know I’ll have a blast reading the next one. And I’ve always wanted to go to the Finger Lakes region, but haven’t gotten there yet. So, I’m counting on you, Elizabeth, to take me there in your story. Thanks, Becky! It is soooo beautiful in the Finger Lakes region. There are some wonderful wineries there, in fact one that we visited is a haunted castle that will appear in my third book (not part of the Love’s Destiny series) so I hope I can give you a virtual tour. I love the covers too, and love that you shared the story of seeing the house when you were in New York–I just love that story. Great interview. Keep on keeping on, Betty, and following your dreams. Who would’ve thought when we were at MHS……..
Hi Carol, isn’t that a fabulous story? I want to see the pictures of the abandoned house! Amanda, I have a bunch of pictures of it on my laptop and I know just the one that I want to use for my cover. Lovely interview, ladies! I am a big fan of LOVE’S DESTINY, and I can’t wait to read the sequel. I need to find out what happens next to Emily and Jonathan! And Betty, I think your covers are the very best Crimson has done. They are exquisite. Here’s to many sales! Thank you for coming by, Deborah! I agree with you about Betty’s covers – if I didn’t know a thing about her novels, one look at the covers and I would scoop them right up!